I'd like to make a port of MicroPython for Casio calculators. 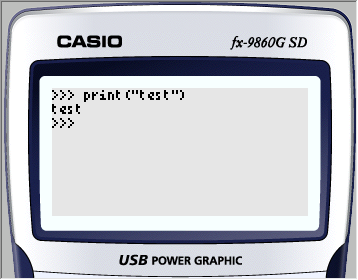 Like TI calculators, they have their own filesystem, and ways to program an editor in C.
ways to program an editor in C.
Will micropython be only code running or does Casio have some sort of OS on-top of which you'll be running your executable? Add some more details about the sw architecture of your environment. Basically you can make (graphical) apps in C, there's an SDK available. Yes: Casio has an OS, and I'm running my executable on top. For output, I replaced the mp_hal_stdout_tx_strn() function so that it calls my custom print() function. For input, the "serial" way of reading wasn't the way I wanted, because it would be better performance-wise if I completely interrupted the program while waiting for input, rather than putting the read loop in a timer, and the input loop in the other. Also, I needed some keys to input strings instead of simply chars (for example, the "^" key inputs "**"). And as for initializing MicroPython, I will initialize it each time I need to run a program (the startup time is almost instantaneous so it makes little difference). - The input() function throws a "name not defined" error; I apparently need to import sys. How do I do that ("import sys" does not work)? And why does print() works but not input()? As for the input() interrupts, I guess there's not actually interrupts, but that MicroPython simply enters the read loop and calls the read function on its own, so I've got little to nothing to do on my side (only listen when the read function is called, and display cursor). - As for import, how do I add modules such as math or urandom (or sys)? As for import, how do I add modules such as math or urandom (or sys)? In micropython code, search for "MP_QSTR_sys". If you have your IDE indexing set up correctly, the code will appear as not included in compilation. In mpconfig.h, you'll see all the macros that are used to include or exclude code in compilation. In mpconfigport.h, you enable whichever macros you need. I'm not surprised it's instantaneous: initialization merely zeros out the heap you pass in and sets up the state variable. Thanks; I set MICROPY_PY_SYS to 1, and now I can "import sys" without a "module not found" error, however I still have the same "name not defined" for the input() function. Is there anything more I have to do? I also defined MICROPY_PY_IO. Edit: nevermind, I had to define MICROPY_PY_BUILTINS_INPUT in mpconfig.h. I am currently trying to implement floats. I defined MICROPY_FLOAT_IMPL as MICROPY_FLOAT_IMPL_DOUBLE, however when I do anything involving floats (even typing "1.1" into the shell) the system crashes with a null pointer exception. As the SDK for Casio only supports C89, I had to implement some functions: nan(), nearbyint(), copysign(), feholdexcept() and fesetenv(). The problem could come from these functions, but I honestly doubt that as I put print statements at the beginning of each of these functions, and nothing is printed. So that mean it's something else. What functions are used when python handles anything related to doubles (no calculations, as I simply type a number into the shell)? Zezombye wrote: I am currently trying to implement floats. I defined MICROPY_FLOAT_IMPL as MICROPY_FLOAT_IMPL_DOUBLE, however when I do anything involving floats (even typing "1.1" into the shell) the system crashes with a null pointer exception. Put a breakpoint in the big switch-statement in vm.c and you’ll see which bytecodes and functions are executed and where the crash occurs. I can't put breakpoints so I did the "manual" method with good old print(). Anyway, I put print statements everywhere (beginning of mp_execute_bytecode, before for loop, beginning of for loop, beginning of switch...): when I type an integer, all print statements are executed, however when I type a double it crashes before it even prints anything.